12-Volt 2, 4, or 8 Amp Charger-Maintainer-Desulphator-Conditioner Model 12248 is a 3-stage Constant Current - Constant voltage - Float mode charger -maintainer-desulphator (conditioner) that extends both the performance and life of all type / size/ brands of 12-Volt batteries. These include all maintenance-free, marine-RV deep cycle, Gel, AGM dry types, as well as spiral wound constructed sealed types such as Optima, Odyssey, Exide, Interstate brands. Push-button selector for AGM, Gel and Flooded (filler caps) types ensures 100% compliance with all leading battery manufacturer's specifications. 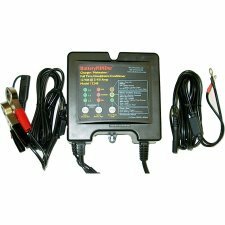 FREE battery condition indicator (1.95 retail value) , with instant pushbutton LED read-out, when you register your warranty on the manufacturer's web site. Simple connection to any type 12 volt battery. Battery Condition Indicator Model 12103 Also free with every purchase: The VDC ABS-248 Temperature Sensor (a 9.95 value). Included with every package ! The BatteryMINDer automatically dissolves power-robbing sulphation crystals using safe, low voltage, high frequency U.S. Patented pulse technology This unit comes with clips, round eyelets only. No cigarette adapter plug. Features: Input: 115VAC Safely charges 70% - 200% faster than any/all known conventional constant voltage chargers. 33 of 35 people found the following review helpful. I have several lead-acid batteries that I need to keep charged up; I heard about desulphating chargers, then found this one. I first used it on a 5-year-old car battery whose voltage indicated that it was at about 40% capacity. After following the directions (about 6 days of desulphating), the voltage jumped up to a point that indicated that the battery was now at 90%. I have a friend who had been trickle charging his older car battery and felt that he had gotten it as fully charged as he could, but then I loaned him this charger and a week later got a phone message from him indicating surprise at how much his battery had improved. He was convinced! It's very possible to double a battery's life with this charger, and so it can pay for itself quickly. The problems with this charger are the complexity and the poor documentation. I think you can see the all the lights and buttons on the front of it - somewhat bewildering to most. So you have to spend a lot of time reading the manual at first, and, I think, it could take a lot less time if they could find a competent technical writer. They KNOW their manual has problems because they added a supplement that says to ignore all the instructions in the manual and just read that one page supplement! The trouble is, even that supplement is a bit hard to understand. One example is how batteries are to treated as large, medium, or small, but they really don't tell you how to classify them. I had assumed a battery for a compact car would be considered medium, but a phone call to their support guy informed me that it was actually large. The manual just assumes that we can read their minds on things like this, but we can't, so we get confused and use the charger improperly. I liked this so much I bought a second one. It brought a lawn tractor battery back to life from the dead, and it worked all Summer long, so it's half paid for already on that battery. I also used it on 3 AGM trolling motor batteries - It has brought them back to usefulness from being in a weak state, not to new condition but 2 are over 12.7 volts after sitting 24 hours, one I am still letting desulfanate, it's back to 11.8 volts after being at 6 volts. These batteries are 8 years old and now cost over $300 each so it's more than paid for itself restoring 2, and it brings the other one back after a sitting all Winter on it I will be very very impressed. From what I can tell so far, it seems to work best defulfantating wet cell batteries but it helps AGMs as well. The new charger I just received is going on a yellow top optima for the Winter to see if it will bring it back. Starting off it was at 10 volts after fully charging and letting sit for 24 hours so it's defin itely toast before letting this charger try to do it's magic on it. Yes, I have a lot of batteries, there are 5 sitting on my work bench now on top of the one in the lawn tractor and 4 installed in vehicles. Keeping all these up to snuff is worth the effort vs replacing them. I would highly recommend this charger. Just as a point of information, for those charging Optima batteries, Optima recommends using the wet setting, not AGM or Gel for their batteries. I use this unit EVERYDAY and have found it to be very reliable. I have owned this unit for more that 3 years. My uses are: AGM batteries in my Electric car to auto/truck lead acid batteries. Tried it on sealed lead acid gel batts. and did not see(not sure if meant for this)any improvement. The only con I have is the durability of the "button select" label cover. It had to be covered with clear moving tape because of exposure. I wonder if can get a new label? Other than label issue this is a great product! I highly recommend it. One of the things I wish Battery Minder would do is, make an onboard multibank desulfator for my electric car. 6 banks is what I need. I really can't see buying six separate desulfators when I could have one unit with six integrated.